Mikhail Ryabko is a Colonel in the Russian Military, the former Chief Instructor of Tactical Training for the Emergency Response Team, and the former Advisor to the Supreme Judge of the Russian Federation. He is credited with founding what is known as Ryabko’s Systema. Mikhail began training in martial arts at age of five, and enlisted in the Russian Special Forces at fifteen. He has been a tactical commander for hostage-rescue teams, counter-terrorist operations, and armed criminal neutralization. He has contributed to numerous military campaigns, and is the recipient of multiple government medals and awards. Mikhail resides in Moscow, where he trains his students in the art of Systema. 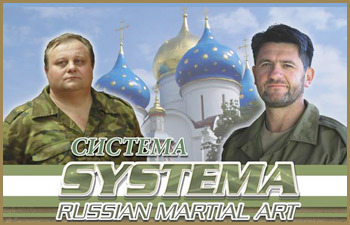 Vladimir Vasiliev is the Founder, Director, and Chief Instructor of the Systema Headquarters in Ontario, Canada, the first training center outside of Russia. A native Russian, Vladimir is Mikhail Ryabko’s most decorated student. His credentials include ten years of extensive military service with the Russian Special Operations Units, with a specialty in high-risk, covert assignments. He has personally trained and certified well over 500 Systema instructors from over 30 countries worldwide, and has produced an Award-Winning instructional film collection.